Hello all! I hope everyone's day is going better than the thought of a thousand purple gorillas performing a rendition of "Hamlet" set to cabaret music!!! So today's post is a bit of a conglomeration of things, a Franken-post if you will. 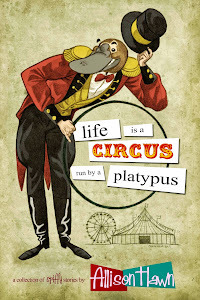 First, "Life is a Circus Run by a Platypus" has been released onto the Kindle! Check it out all you digital reading fans! In any case, if you've never been to Monkeyboy Books, you should definitely take a gander at it. It has to be one of the most adorable, cozy, little bookshops I've wandered through for quite some time. See, doesn't that just look cozy as all get out? Also, the shop owner, Marina, was gracious enough not to call for the Mental Health Professionals when I found a copy of "Robin Hood" in her shop and did a very excited, partially coffee induced, happy dance. So in my perusing of the literary world, I ran into a funny little book that I feel deserves some mention. Edmund McCombs' book "Stuck at Seven (While Awkwardly Aiming for Ten)" not only has the best picture of an absolutely horrified little kid on the front of it, but is a very frank, unashamed collection of short stories that many people can relate to. 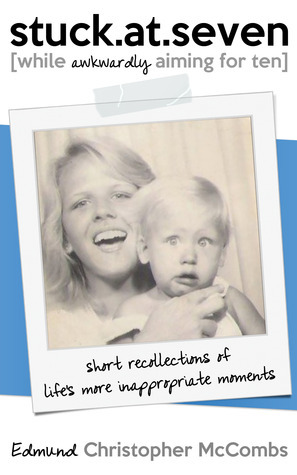 Covering everything from schoolyard bullies to bad bosses, Edmund's stories will make you chuckle as he takes you from one awkward situation to the next. I know that has nothing to do with the price of pie, but I spent a lot of time thinking of all the places, things, people, I could run over in one of those. 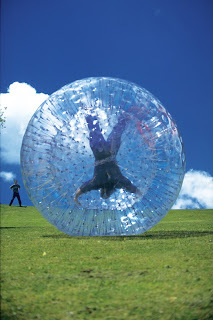 Wouldn't it be fantastic to to go down a hill in one of these? Anyways, this is probably a sign that Friday has officially eaten my brain and I should stop writing. Have a wonderful weekend everyone! As always feel free to follow my swashbuckling exploits on Facebook, Twitter, and Goodreads!!! Thou Shalt Not Sweat on Me!